A typical town in the Le Marche region of Italy. Vera Marie Badertscher contributed this guest post. The first time I went to Italy, I wanted to see the popular cities, but I also wanted to settle in to one of the country’s lesser known places. One by one, I looked at various areas. The fact that I couldn’t find much information online about Le Marche, confirmed my sense that this was the place to go. The long, narrow region stretches down along the Adriatic Sea from not far south of Venice to a spot roughly parallel with Rome. Its western edge is the ridge of the Apennines, the mountain spine that runs the length of the Italian boot. Searching more, I learned the pronunciation is le mar-kay and it is sometimes rendered The Marches in English. That info came from the most solid source of information, an independent website called Marche Voyager. In the week my husband and I spent exploring Le Marche in our rental car from the north to the south, we never saw a tour bus. We never saw a t-shirt shop. What we did see were so many hill-top medieval and Renaissance fortified villages and castles that we felt deprived when we saw a hilltop that grew trees instead of stone walls and turrets. Tips: You’ll need to drive or get a car and driver to explore those fascinating old Le Marche towns. Also, the beach areas are crowded with Italian tourists during mid-summer. May, June and September are the ideal months to tour Le Marche. 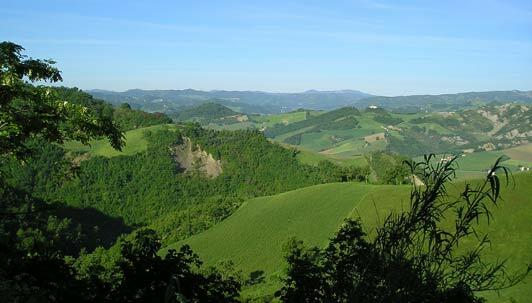 Hills of the Le Marche region on Italy’s east coast. Photo credit: A Traveler’s Library. Where to stay? Since the Italian government started giving tax breaks to people who operate agritourism businesses (think farm stays), the number and variety of farms that take in tourists has mushroomed. Except that in Le Marche it would be truffles rather than mushrooms. We headed for an agriturismo that was once a hilltop commune – a collection of stone buildings for farmers. The décor was quirky, the hosts unusual, and the landscape absolutely breathtaking. We made arrangements in advance so we could eat dinner there, help with bee keeping, and learn to make herbal infusions. 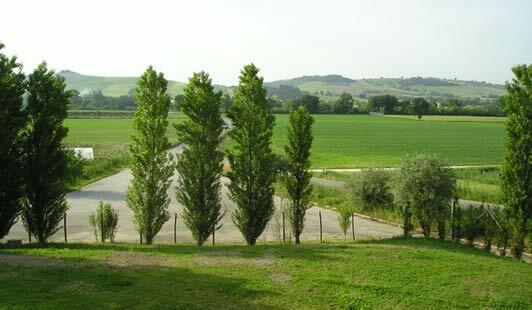 You can browse the agritourism options in Le Marche here. 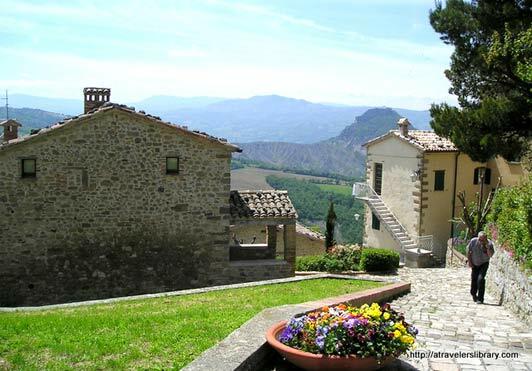 While you are in the north of Le Marche, you’ll want to visit several castles and hill towns. For the ultimate in reliving the Renaissance, don’t miss Urbino, a UNESCO World Heritage site with an enthralling history. This video will give you a sense of Urbino’s beauty. of Macerata, Le Marche. Photo credit: A Traveler’s Library. To tour the southern portion of Le Marche, including the seashore, we based ourselves at Le Case, a spa hotel in the countryside outside of Macerata. The hotel occupies a 14th century convent and the restaurant is in a converted stone barn – yet everything inside is the ultimate in luxury and design, mixing antiques with modern amenities. The hotel’s large indoor pool is shared with locals. Two restaurants (one with a Michelin star) take great care with locally sourced food, much of it from their own farm. The waiter even gave us a detailed description of three olive oils – like a sommelier of olives. 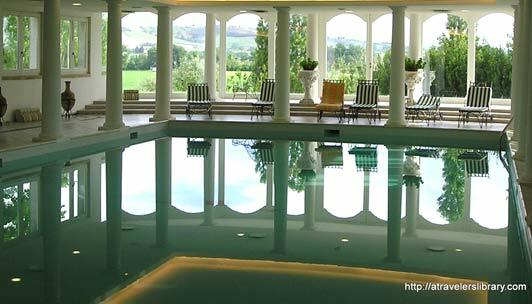 The indoor pool at Le Case overlooks the countryside near Macerata, Le Marche. Tip: Opera lovers will want to time their visit to coincide with the open-air opera festival in Macerata in July. Vera Marie Badertscher’s A Traveler’s Library helps you find books and movies that inspire travel. Her Ancestors in Aprons site links the memories stirred up by food and tracking the lives of ancestors. I think this sounds like a place I will want to go…Maybe Sept 2014!